Granada has 25 more brand new rental electric motorbikes that create an offer of 75 non polluting vehicles. The Major has committed to take actions in the battle for a real and meaningfully transformation of environment in the city of Granada. 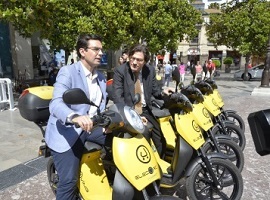 Granada has already 45 new rental electric motorbikes, that added to 45 operational from September 2017, make a fleet of 75 electric vehicles in operation. In words of the Major, Francisco Cuenca, our city takes a step forward in along the way of environmental substainability and the committment to use new non polluting means of transport. .
During the presentation of these vehicles, that also was attendant by Mobility Councillor Raquel Ruz, and Horacio Pérez Perdigó as president of the driving company of this initiative, Muving España, the first town councillor has underscored that a cleaner air and more friendly city for citizenship means a change in ways of displacements and a reduction of use of private polluting transports. So, Muving motorbikes are L-3 model, -comparable to 125 cc-, are completely electric, work with non polluting combustibles, that guarantee zero emmissions to preserve environment, contribute to stop climatic change, and teaches people advantages of use of electric vehicles. Also guarantee that they do not emit noises when driving so acoustic pollution will be reduced in the city. As Horacio Pérez has explained, vehicles are connected to a communication platform and monitored in real time and work with two batteries, that are being replaced by workers of Muving company when the fleet management system register an incidence.This way, user does not have to care about motorbike keys, insurance, fuel, or any maintenance. The objective of the company is, as the president says, to arrange one hundred motorbikes before the end of the year. After appreciating Muving its implementation in Granada, Francisco Cuenca has mentioned initiatives that the City Council is being carried out towards a substainable mobility. In this respect has also mentioned the commitment for a municipal zero emmissions vehicles fleet or brand new ecological minibuses for Albaicín and Realejo. Concerning to non motorised transport, has reminded that last October came into operation a brand new system of shared bikes with no station predetermined and has cited the agreement City Council - Junta de Andalucía to boost the use of bicycle in the capital, among other actuations..
We will keep going further in our fight for a real and meaningful environmental transformation in the city of Granada, has ended the Major, and in such a touristic, young and universitary city as this is, our committment is to achieve a substainable mobility, and aim for universal accessibility and help, with efficience use of public resources, to improve welfare and quality of life of people.